Nothing makes a father prouder than seeing his son follow in his footsteps. We are very proud to say that our family has been rooted in the tree service industry for 4 generations. Fifty years ago my grandfather began teaching my father what he knew about trees. From the time I was a small boy my father has taught me the knowledge that was passed on to him as well as the skills that he had acquired through the years. I am happy to continue this tradition with my 3 sons and 2 daughters. Just this summer my oldest son started his first summer internship with us, officially making us 4 generations strong. You might hear me crack a joke about being another branch on my family tree. Or you might hear me say that I have sap coursing through my veins (which may or may not be true). This website is full of puns like “have a Prob-Limb? Leaf it to us” and “We are rooted in Raleigh”. But all joking and puns aside. We love what we do, and we wholeheartedly love Arbormax. It is as much a part of our family as anyone. We see Arbormax as a family member. The friendly, loving smart family member that is always there to help. That is the way we run Arbormax. We want all of our clients to know that Arbormax cares and wants to help them. We use integrity and courtesy and we operate on a simple set of principals “Do what is right and do the right thing”. We are rooted in Raleigh. A lot of things have changed since my grandfather cut that first tree all those years ago. Chainsaws have gotten better and stronger, climbing methods have improved and the overall understanding of a trees needs has advanced greatly. There is one thing that has remained unchanged over time. That one thing is our commitment to our clients and their satisfaction. Our clients and the relationships that we have formed with them are as much a part of who we are as anything. We have been fortunate enough to have fantastic customers throughout the years that really appreciate our level of service. I don’t think we can emphasize how much we really appreciate and care for our clients. We honestly treat all of our customers like they are our only customer. After all, what is a business without customers? My youngest son (pictured above) already has 8 years of experience and he is only eleven. The picture on the left is when he was three. The picture on the right is him at eleven. It won’t be long and his saw will be a real one. 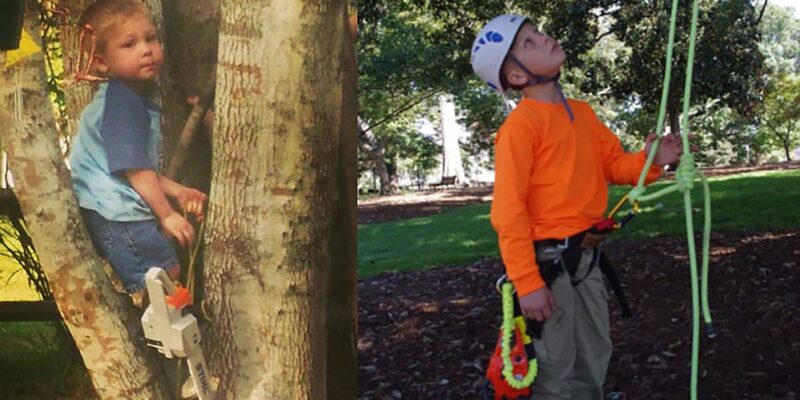 He is the 4th generation of our family to be a tree worker.